We are extremely excited to announce that our first beer and food pairing event is this coming Valentine's Day! 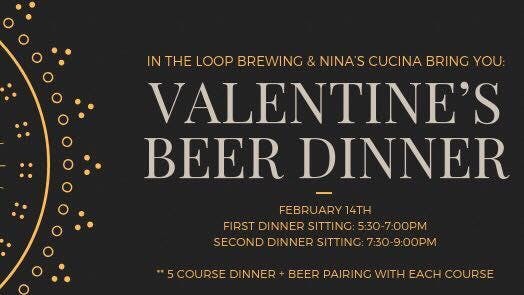 We have proudly partnered with Nina's Cucina to bring you a delicious 5 course dinner and beer pairing experience! There will be two :90 minute sittings to choose from. Seats intentionally are VERY limited so that we can bring each ticket holding couple the attention and ambiance you'd desire on this special day. *** THIS RESERVATION IF FOR THE FIRST SITTING WHICH BEGINS PROMPTLY AT 5:30pm (AND ENDS AT 7:00pm). Attendees will receive:~ A 5 course freshly prepared meal!~ A 10oz craft beer paired with each course! Don’t drink beer? We can do wine instead!~ An In The Loop Brewing glass to keep! ~ Plus more!Join us for this romantic evening with your love and let us guide you through handcrafted meals and handcrafted drinks at the Loop!